After I calmed down enough to see just what I would be doing, who Comcast was partnering with, and who I would be interviewing, I got even more excited. Turns out, Comcast is partnering long-term with the San Francisco Chinese Chamber of Commerce and will be a procession-level sponsor of the 2019 Chinese New Year Festival & Parade on Saturday, February 23. Joining them in the procession will be the KIPP College Prep San Francisco Marching Band and the San Francisco Police Lion Dance Group. While this long-term commitment is important in the sense that it is one example of how much Comcast partners with, serves, and gives to the Asian American communities in San Francisco and throughout California, that’s not what I’m most excited about. I’M GOING TO BE ON THE COMCAST FLOAT. The Comcast float will have interactive features so parade goers can influence the color and motion of the float’s lights and that’s cool and symbolizes the speed and innovative solutions Comcast provides its clients every day – but I’M GOING TO BE ON THE COMCAST FLOAT!!! And I’m going to be on the float with world-renowned pop singer, Jason Chen, and international model and actress, Lucia Liu. I even get to interview them – and for those of you who know me, this is super exciting because I’m always looking for bilingual Chinese content for my children. Now, I’m going to get a direct hookup! I confess, though I have been a Comcast customer since 2004 (and my parents, even longer), am part of their Asian American audience, and really appreciate how Comcast offers an extensive array of international channels and in-language programming to serve the Asian American community, being included in the parade is what I’m going to think about from now on when I think of Comcast. You would think that since I grew up in the Bay Area and the Chinese New Year Festival & Parade has been under the direction of the San Francisco Chinese Chamber of Commerce since 1958 (but goes back to the 1860’s), that I would have attended at some point in my life. Sadly, my family was not a parade-going type of family – and neither am I.
I’m going to have to figure out how my husband is going to be able to take our four small children to see me Saturday night by himself. You see, the reason I am so excited is because when I was growing up in the Bay Area, it was rare for me to see Asians – let alone, Asian Americans – on TV, in the movies, or in any art or pop culture I consumed. But short of Connie Chung, George Takei, Michael Chang, Bruce Lee, Kristi Yamaguchi, and Claudia Kishi, that was it. In one breath, I have named them all. All six famous Asians – of whom only five were also Americans and one of whom was fictional. Of course, there were other famous Asian Americans, but even the fact that we can likely name the others only proves my point: we were few enough so that you could name them all. There is a deep sorrow and melancholy in wanting to be seen; acknowledged. To be considered worthy of notice. To be the main character in the story of our lives. So, you can imagine my joy and surprise that I, along with so many other Asian Americans, are being sought after and included by a big company like Comcast. And not only for one-shots related to Lunar New Year festivals. I worked closely with Comcast throughout 2018 on many different events such as the program, HELLA ASIAN: A Night of Diversity in Storytelling, which they sponsored for the Asian American Journalists Association. Plus, last month, I attended Brandi Riley’s Courage to Earn MORE Retreat, a small, boutique style mastermind geared towards women entrepreneurs (of which, over half the attendants were women of color) that Comcast also sponsored. We were even hosted at their Livermore headquarters! I am ecstatic that Comcast is committed to amplifying our art, allowing audiences to easily access thousands of hours of Asian and Asian American entertainment via Xfinity On Demand by saying, “Asian American” in the X1 Voice Remote. Plus, for the first time, online content from streaming services KOCOWA, Hi-Yah!, and Amazon Prime Video will also be included. Honestly, I just want to see myself reflected in the stories Comcast chooses to highlight. I want my children to see people like themselves on TV, in movies, singing, dancing, and creating art. I want my people to be valued and appreciated and flourish in the arts and entertainment industries. But most importantly, I want to be on a float. This is the first post of a series of blog posts sponsored by Comcast. All opinions are mine and mine alone. 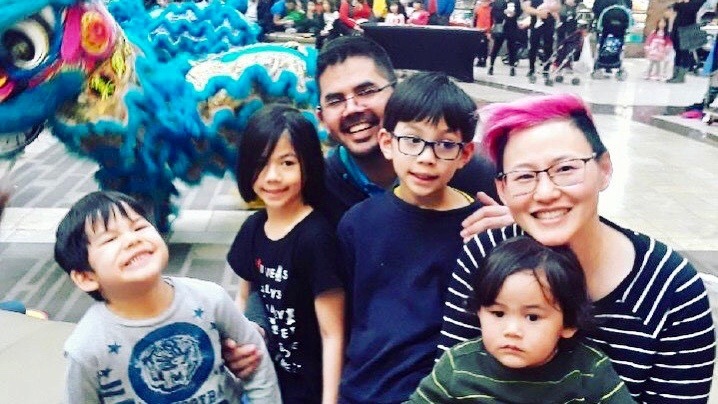 Virginia Duan is a Taiwanese American writer at https://comca.st/2GJwyez who focuses on parenting through brokenness, teaching kids Chinese in an English dominant environment, and anything that catches her fancy. She wields unflinching honesty, fury-tinged humor, and ten words when one would do.